Today, since it is Martin Luther King, Jr. Day, I am commemorating the man with a book about him. Theme: Dr. Martin Luther King’s life, private and public, told from the perspective of his family and a few close associates. Opening Sentences: From the page facing the introduction: In these pages you will experience the love and the struggle that surrounded Dr. Martin Luther King Jr. as he developed into a leader of a movement committed to a just society for all people. The personal reflections of family and friends featured here attest to the power of peace and harmony that he expressed. Synopsis: Compared to most of the many books I have read by or about Martin Luther King, Jr., this was an easy read. 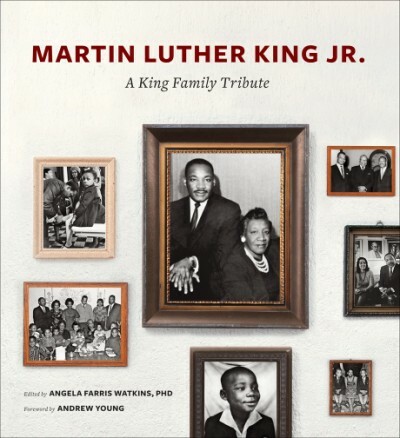 It’s like a combination family photo album and a tribute album, sharing many family photos that I’d never seen, enhanced by letters and short essays by various members of MLK’s family from his parents (published posthumously, obviously) to his great nieces and nephews. It’s a nice compliment to the more weighty books I’ve read. I was most impressed by an essay by his nephew, Isaac Newton Farris Jr., who began by saying that although he never met Dr. Martin Luther King, Jr., he did know Uncle ML. Reading his reminiscences about the guy he used to play with and then how he grew into a knowledge and admiration of the man who led a movement, was so good, showing both sides of the man. I liked this book, but I wanted more! Martin Luther King’s life and work have influenced me since I was young, although not having a direct impact on my life. This man, his way of being, his nonviolent fight for justice, his life as a drum major for peace and righteousness, have influenced my way of thinking about people and about our society, they have influenced my actions, they continue to inspire me. As well as this book, I’d like to recommend a couple of the books I have read over the years. The first I read was when I was in 9th grade, in 1970: MY LIFE WITH MARTIN LUTHER KING JR., by Coretta Scott King (the book was published in 1969, just one year after Dr. King was assassinated.) A TESTAMENT OF HOPE, published in 1986, compiles his essential writings and speeches into one large tome. There are so many others. Delve into them, let them inform you and inspire you. For Further Enrichment: The King Center for Nonviolent Social Change in Atlanta. It’s on my bucket list. Find the website here. Martin Luther King Jr. National Historic Park. The website is here. Elementary school kids express dreams inspired by Dr. Martin Luther King Jr.
A perfect choice for today! On Martin Luther King Day…a perfect post. I also blogged about the great man. He remains such an inspiration. Thank you, Niamh. Since my childhood, he has been one of my heroes. We need his insight and his inspiration very much these days! I’m glad you also did a post about him.